My mom loves to garden. She has a very “vibrant” green thumb! Anything she plants bloom hundredfold better than anyone I know. Five years ago when she (along with my Dad and my brothers) had to go back to the Philippines, I took home the plants that were left in her green house. Sad to say, I did not inherit her green thumb. I killed most of her plants – her cactus collection, orchids, Japanese bamboo or fortune plants, jasmine and other indoor/outdoor plants. 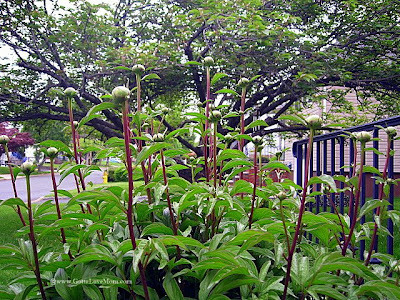 I managed to keep a few of her plants – the peonies. My 8yo calls them “Mama’s roses”, and proud me I have four of them. 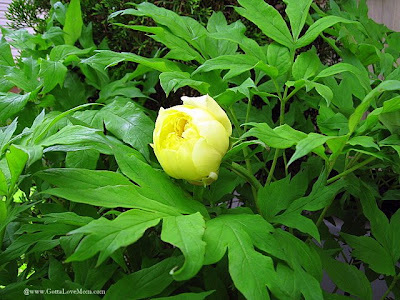 The yellow peonies bloom before the red and the pink. 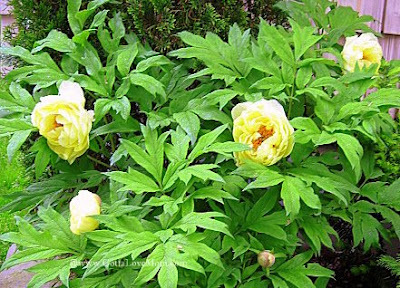 The yellow peony bush blooms one bud at a time and then in a week’s time, all of a sudden I have five flowers! These are BEAUTIFUL! Your very lucky to have them. I wish I had her green thumb too. My mother in law grew an avocado tree out of a pit! it took 15 years and the tree was huge! The landlord cut it down about 2 years ago, against our wishes. We begged him, yet he did it anyway. It broke her heart. I asked her to "grow" me one and she said, I was lucky to have the other one..He liked me. LOL. I tried to grow her one here at our house, and NOTHING happened. She giggles and says..Mr. Avo, didn't like you, did you kiss and hug the pit? So pretty!! My mom is a great gardener too. Me, I can't even keep an aloe plant alive. Seriously! And those things aren't easy to kill either. Leave on with me for a week and it's sure to be a goner! I definitely did not receive any gardening genes from my mom. You really have to have a nack for plants. Sometimes it takes patience and a LOT of love. I miss my garden. I look forward to the day when I can have one again...it really was theraputic to me. Peonies are one of my favorite flowers. Personally, I think they are much better than roses. The smell is intoxicating. I have one pink bush, but hope to have more in the future. What a beautiful reminder of your mother. It's so interesting what sights, sounds and smells remind us of people we love who we can't be with and certain times in our lives. I smell garlic and think of my grandmother in her kitchen. I smell Halston and suddenly I'm in 8th grade going to my first dance. Thanks for making me think...hmmm...could be just the prompt I've been looking for for a new post. 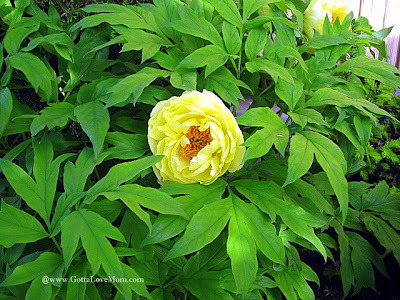 Your peonies are lovely! My mom has green fingers too but all I have are two half dead plants on my balcony!! Absolutely gorgeous! I wish I had a green thumb. I kill everything, even cactus. Your pics are beautiful a usual. How wonderful to have those to feel your mother is close. It must be so hard to have your family far away (other then your immediate family of course). The flowers are beautiful. My mom also has a green thumb and I definitely did not inherit it! I do manage to grow my vegetables though. THANK YOU FOR SHARING YOUR AWARD WITH ME! Your the sweetest! and most lovely lady. HUGZ my friend! and THANK YOU AGAIN!!! !